Elder Jeffrey R. Holland and Sister Patricia Holland went with President and Sister Nelson on their trip to visit Church members around the world. They visited eight countries. At each stop they met thousands of people who were so happy to see a prophet and an apostle! Almost all the places they stopped in either already have a temple or will have one soon! Their first stop was Jerusalem, Israel. They saw the Mount of Olives, a place where Jesus taught His disciples, and the Old City of Jerusalem, where Jesus walked. Next they visited Kenya, a country in Africa where a temple is going to be built. Elder Holland encouraged people to gather their family history and come to the temple when it is finished. “Nothing will bless you more,” he said. President Nelson and Elder Holland were excited to visit Church members in India. They looked for a place to build a temple there. It will be the first temple in that country, which has more than a billion people! 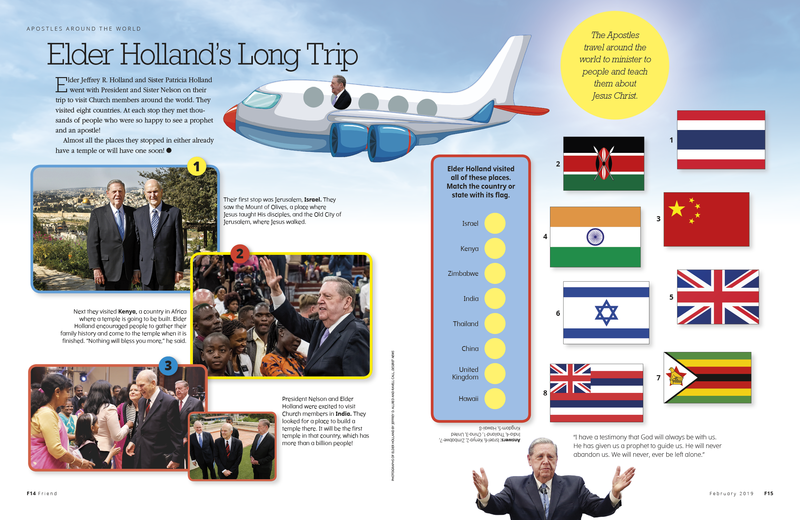 Elder Holland visited all of these places. Match the country or state with its flag.